This process is incredibly easy.. and so neat! It is like a science experiment. You simply whip cream so long and fast until the solids separate from the buttermilk. It takes about 15 minutes and a standing or handheld mixer. I will show you the process in pictures because the cream goes through multiple stages before it becomes butter. Be patient and keep a close eye on it. I've read that the fresher the cream, the better. In the summer, I like to go to local farms and get farm fresh eggs. From now on, I will be getting some fresh cream as well! Just two ingredients, heavy cream and salt. Pout the cream into the mixer and slowly increase speed to high. At this point, it is like a sift whipped cream. Now a stiff whipped cream. It just keeps getting thicker. Now it is starting to resemble butter. At this point, turn you mixer down because you don't want the buttermilk to splash everywhere. Keep going and the butter will start to separate even more. Isn't that cool! Once the butter pulls away and forms a ball, it is ready to be strained. Take the butter and strain any buttermilk through a fine mesh sieve. Cheese cloth would work even better but I didn't have any. This is an important step as it will last longer if you remove any excess buttermilk. I am always trying to find "restaurant quality" meals to make at home. Going out to eat can be so expensive and half of the time when we go out, I end up saying "I could make this at home for half the price!" When I got home from work a little bit early today, I decided I was going to make something nice instead of going out. I am happy to report that this turned out fantastic and will definitely be in my dinner rotation from now on! 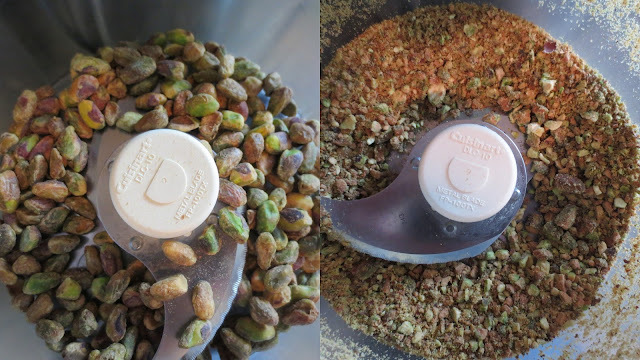 You will see that the pistachios will have a combination of both coarse and fine pieces after you pulse them in the food processor. Broil the cherry tomatoes until they char and burst. Dip the top of the halibut in a beaten egg and then in the crushed pistachios. Put pistachios in a food processor and pulse until coarsely ground. Beat 2 eggs in a shallow dish. Dip the top of the halibut into the egg and then into the pistachio mixture. Be sure to firmly pat the pistachios into the halibut so they create a crust. Heat 2 tablespoons of each olive oil and butter in an oven safe saute pan over medium heat. Place halibut pistachio side down and saute until golden brown. Flip and place in the 375 degree oven. Depending on the thickness of the fish, it will take 10-20 minutes to finish cooking. To determine if fish is done, you can either cut a tiny piece out of the thickest part to see if it is flaky or touch the top to see if has a firm, "bounce back" touch. While halibut is cooking, place another saute pan over medium-high heat. Drizzle a little olive oil in and add mushrooms and shallots. Once the vegetable soften, deglaze with white wine. Once alcohol stops steaming, turn off heat and vigorously whisk in butter then season with salt, pepper and thyme. To plate, cover dish with beurre blanc. Place halibut in middle of plate and garnish with fresh arugula, charred tomatoes, lemon wedge and a drizzle of olive oil. My family has been making this dip for years and it is always a hit at parties. The crispy wontons are absolutely delicious and the creamy crab dip is the perfect complement. This recipe makes a pretty large portion of dip so if your group is smaller, cut the recipe in half. You can normally find the wontons in the produce section of the grocery store. I always get the package with two stacks because these chips go quick. Cut the wontons into 4 equal squares. Heat the oil over medium high heat in a pan. I only put 6 chips in at a time because they cook so fast. Use two forks to flip them and remove from the pan. I found that tongs can be too rough and crush these delicate chips. Once chips are finished frying, drain them on a paper towel lined cookie sheet. It is important to whip the cream cheese mixture first and then add the vegetables and crab. This helps smooth out any cream cheese lumps. Here are the vegetables. Be sure to chop them very fine so you don't have big chunks in the dip. After you have mixed the vegetables into the cream cheese mixture, gently fold in the crab meat. 1 large package of wontons, 12 oz. Place cream cheese, sour cream, mayo, sriracha, soy sauce, sugar, sesame oil and fish sauce in a bowl and mix until smooth. Stir the red pepper, water chestnuts, garlic, green onions, and ginger into the cream cheese mixture. Finally, fold crab into the dip and refrigerate for at least one hour. Heat oil in pan over medium heat. Cut wontons into 4 equal squares. Once oil is hot, add 6 wontons in at a time. 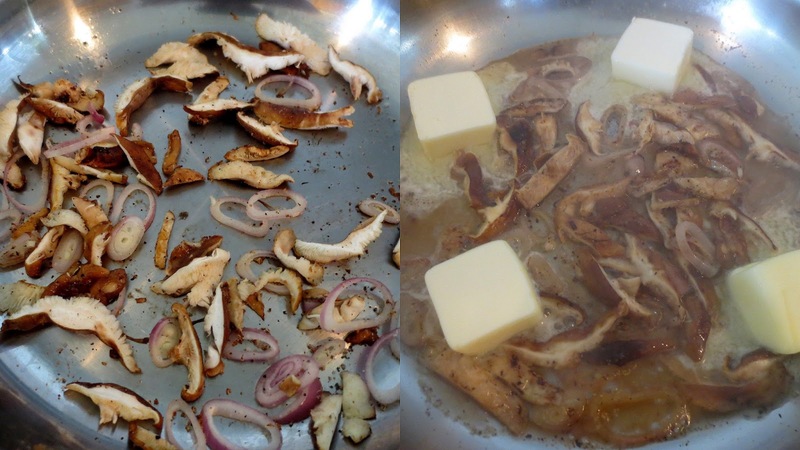 Fry for about 10 seconds, flip, and then remove almost immediately and place on a paper towel lined cookie sheet. Last weekend my Mom and I made a quick trip to my Grandmother's house in Madison, Indiana. She is staying with my Mom for a few weeks so we went down there to pick up some of her belongings. 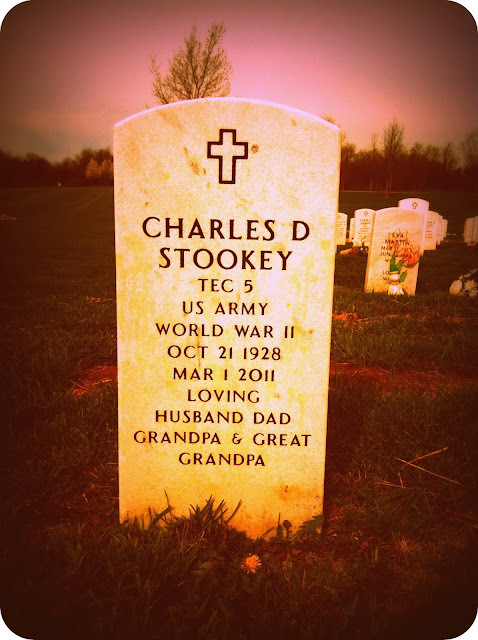 My grandfather passed March 1, 2011 and we all miss him so much. He was an avid art collector and truly had a unique ability to see the beauty in everything. My grandparents ran a bed and breakfast for many years in a Carriage House that is behind their main house. I have the fondest memories of going down there to visit every summer to spend quality time in the charming city of historic Madison with my amazing grandparents. There is the Carriage House from behind the fence. Her doorbell. I love it. This is an old copy of my grandfather's resume. I thought it was so cute how he put his height and weight. Check out his phone number; Adams 4-3942. I just thought this was such a neat piece of his history so I decided to frame and hang it. I also framed and hung some of the pictures I took. 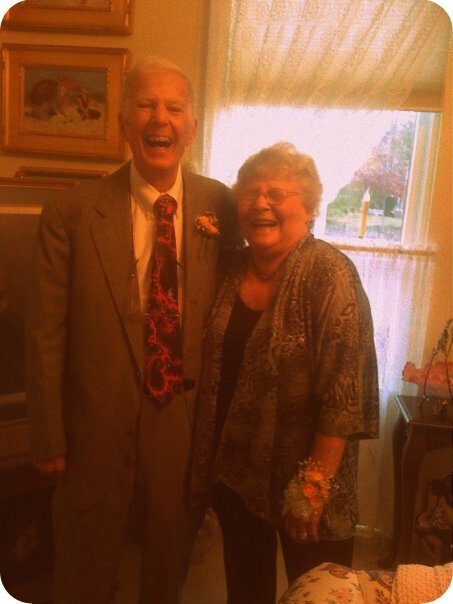 Like the this one of my grandparents on their 60th wedding anniversary. I can't wait to visit again. In addition to cooking, I am also enjoy arts, crafts, furniture refinishing... basically anything that allows me to be hands on and get the creative juices flowing. A good friend of mine just moved back to the area and I have been thinking of what to get her for a housewarming gift. The other day I was flipping though my Williams-Sonoma magazine and they had the most beautiful wreaths but they were upwards of $100 each. So I decided to make one on my own! I got all of the supplies from Hobby Lobby (Michael's and JoAnne's probably have the same stuff) and this was very easy and inexpensive to make. I'm very pleased with how it turned out and just love the burlap ribbon and flower. When you take the moss out of the bag, it can stick together so have scissors handy. Begin by squeezing hot glue on about 2 inch sections of the wreath. You don't need to put moss on the back but be sure to get the inside and outside curves. Almost halfway done. It helped me to remove the moss from the bag, cut off sections and have them ready before I hot glued the surface. Now that the moss is all finished, you can decorate it with whatever embellishments you like. I am slightly obsessed with owls so I got these cute little ones for when I get around to making one of these for our front door. For my friend's wreath, I am going with something a little more classic and rustic. Oh and this is pretty messy. Moss was flying everywhere. If the weather was nicer, I would have done it outside but Mother Nature decided to send us a snowstorm in late April... so indoors it was! This is how I had originally had it but it just didn't look finished enough for me. So what is a girl to do....? Add a bow of course! To do this, I cinched the burlap ribbon with some floral wire. Then I tied a separate bow and secured it to the cinched area with some more floral wire. Voila! And hopefully this will grace a door in my friend's new home! Hello blogosphere! I have been incredibly busy lately but wanted to share this quick but amazing "recipe" with you. No, it is not food but rather a body lotion. And you will use for the rest of your life once you try it. From my mother, I have inherited her incredibly dry skin. Winter is the worst and I have yet to find a lotion that soothes my scaly skin...until now. I found this recipe on Pinterest and figured I'd give it a whirl. I wanted to wait until I used it for a bit to attest to its quality and I can now say that it has passed the test! I have seen a visible improvement to my skin. I actually purchased all of the ingredients from drugstore.com. They ship free for orders over $30. But these are basic items you can get at any drugstore. So, if your skin is i need of some serious quenching, I highly recommend you whip up some of this... pronto! Throw it all in a bowl and mix away! It is a smooth and fluffy lotion. It can be a tad oily when you put it on but my dry skin soaks it up in just a few minutes. Combine everything that was left on the sides and bottom with a rubber spatula and transfer to a jar. I used a wide mouth, old fashioned, glass canning jar. Cheers to smooth, hydrated skin!